In order to have good PC protection a strong antivirus solution is needed and there are a number of things that it must include. Here we give you an in-depth PC Protect Antivirus Review, so you can see if it ticks the right boxes. Our overall rating is high for this provider which we recommend. To keep yourself protected online you’re going to need to find an antivirus solution that for a starters has robust firewalls, it should also have proper bonus tools for safe browsing and have the ability to detect and isolate spyware or malware in real-time across a number of devices. Try PC Protect Antivirus – 30 Day Money Back Guarantee. Should You Choose PC Protect Antivirus Software? 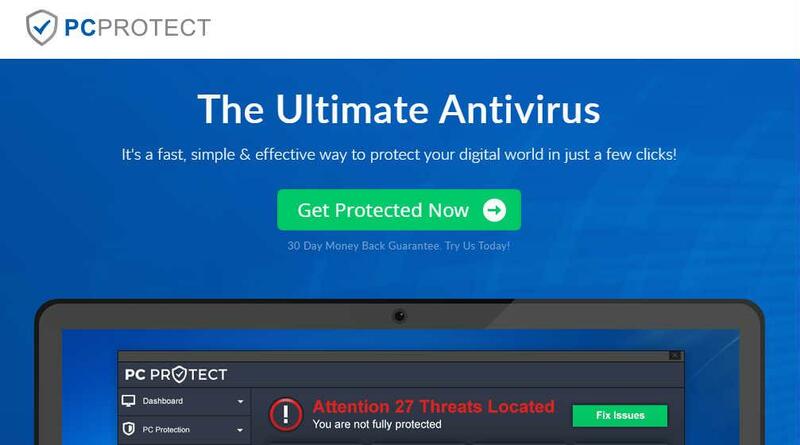 In this PC Protect review we have outlined that it has a strong malware protection program and even includes a decent VPN (free bonus!) PC Protect is a great choice when sifting through your options of antivirus software. With round the clock attentive support, there is always a way to figure out any issues you may have. Although it is a little pricey, their special offer for the first year makes the first term great value for money. A smooth user interface and super simple installation make it great for those with little tech knowledge. PC Protect will work its antivirus magic quietly in the background so you can enjoy browsing with peace of mind. 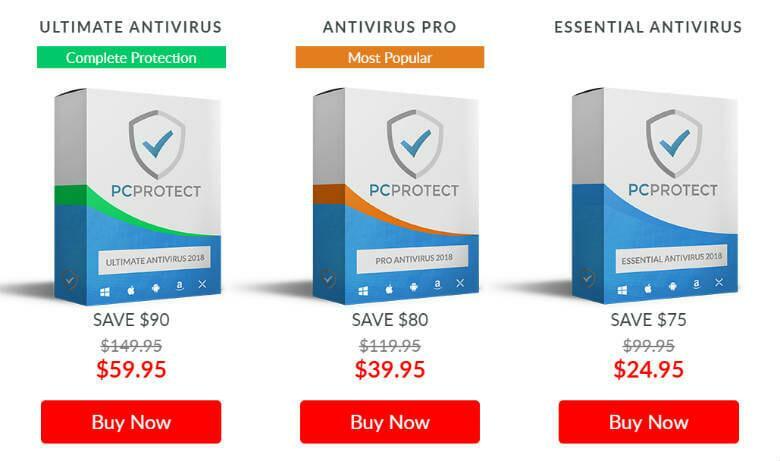 Antivirus Pro 2019 offers a year’s worth of any device/PC protection starting with an introductory price of $49 and even includes a 30 day money-back guarantee. If you keep your eyes peeled, you might spot the occasional special offer on their website (or as you might have seen around in other PC protection software reviews) to reduce the price to $39. When the year is up however, the contract will be renewed at the full price of $99. There’s also the option of purchasing the Enhanced Firewall for the small fee of $19, or add the System Boost for another $19, which will drastically enhance your performance. Currently, these two extras are being handed away free of charge with the Antivirus Pro (excluding VAT). Payment can be completed via Visa, Mastercard or American Express. Some PC protection reviews might discuss the if’s and when’s of deleting malware from your device; however the really important thing you need to know is that, if you come across any issues during scans, PC Protect service will jump right on it and quarantine the malware in real time. PC Protect services work in real-time makes it impossible for you to download something malicious without it being checked thoroughly by the antivirus software. There’s a bunch of bonus tools up for grabs (we go into one of them – the PC protection – below) free of charge that will keep your computer running smoothly, restrict and detect ads, spyware, or any other dangerous content. The PC protection service reviews your entire device and if something malicious is found in the search results, you will be notified by Web Shield. The ad blocking tool will prevent popups and spam on your computer making for a much more enjoyable browsing experience. With their vault system you can design and maintain strong and safe passwords keeping you well away from potential hacking programs that attempt to worm their way into your accounts. There are two types of scanning methods offered by PC Protect Antivirus; quick scan and a full system scan. This allows for quick daily scans as well as giving you the option to do a more in depth scan every now and then. You can set up a schedule for when the antivirus will check your computer/device. With the basic scan, it will check your browser, cookies, cache, desktop and startup whereas the full system scan check the whole internal disk. Phishing schemes are becoming more and more prevalent as they try to grab ahold of our sensitive online data. To keep yourself protected from cyber-crime, a strong firewall security system needs to be in place. PC Protect has a basic firewall that you can use to control the Windows firewall (with easy switched to turn it on or off). It doesn’t have any extra power on its own, and is by no means a reason to choose this antivirus software over another. One of the best things about PC Protect is that there is a wide variety of platforms and devices which can be covered by the same antivirus. For example, if you have a Windows laptop but at home your computer is a Mac. Or you have an iPhone and your partner has an Android phone. Or maybe your kids use an Amazon Fire. This is all no problem for PC protect because all of these devices, including tablets and chromebooks can be protected. For all the technophobes out there, if you are stuck on installation, there are perfectly clear installation guides found on the website in the help center which includes how to install PC Protect onto Windows, iOS, Android and Mac. Mobile and desktop tutorials show you exactly what to do step by step making setting up your antivirus really easy. We will go through setting up Android for example. First simply login to the Play store on your device, search for PCProtect and then click install – simple! You could also log in to your PC Protect account online using a web browser and then click on the ‘Download App’ tab and choose Android from the list. Simply fill in your email address and you will be sent a link to your mobile providing the most up to date version of the app. As soon as you have installed it, log in with the same credentials and you are ready to go. One of the biggest advantages of PC Protect is that it can be used across so many platforms, each of which have a great, simple and easy to use user interface. The black background and strong buttons make it perfect for those less tech savvy to use making it a great family choice. It is easy to switch between a quick scan and a full scan. By setting up automatic scans as often as you choose you can sit back and relax while your device runs smoothly. The left hand side toolbar has everything you need; a Safe Browsing VPN, Web Shield settings, and more. The only thing missing is a free trial, though the simplicity of the user interface means it’s hard to imagine anyone struggling with it. There’s always the 30 day money back guarantee if anyone really isn’t getting along with it. There is an online knowledge base where you can find numerous articles regarding set up and installation. There are also easy to follow tutorials on many subjects including how to make the most of your product on different devices, and understanding the dashboard, to name a few. There is also a few ways you can contact support if you feel the need. First off there is email support, secondly you can phone directly and thirdly there is the website live chat bar. This broad range of customer service is open 24 hours a day, so there is always someone there to help you with your needs, making PC Protect stand out from the crowd.